Award-winning documentary filmmaker and commercial director Stacy Peralta of Nonfiction Spots and DDB Chicago created a new commercial for Budweiser which honors three generations of the Earnhardt family's NASCAR success. The spot debuted on Father's Day, during the broadcast of the 3M Performance 400 from Michigan International Speedway Using stock footage gathered from The Earnhardt family, Anheuser Busch, The Associated Press, Getty Images, NASCAR and Sports Illustrated, and working side-by-side with his colleague, editor Paul Crowder -- who edited Stacy's documentary features "Dogtown and Z-Boys" and "Ridings Giants" -- the spot collects 50 years of the Earnhardt family's racing legacy and, of course, aligns it with Budweiser's support for auto racing. 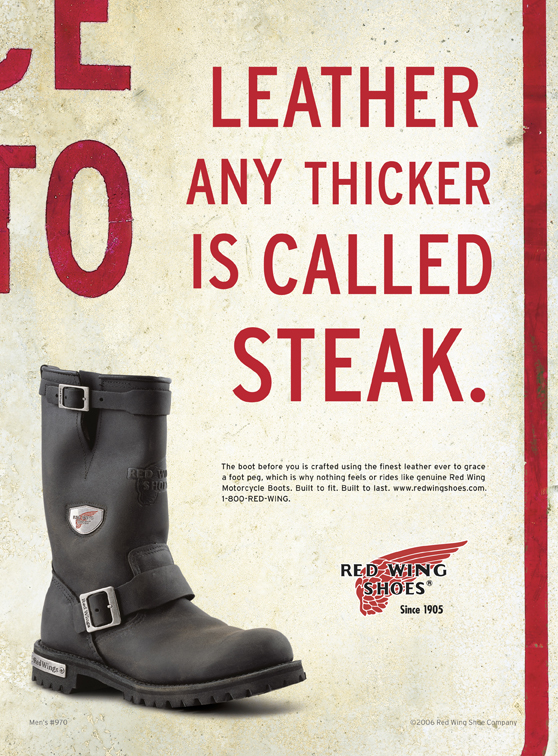 - Red Wing has launched a new print campaign to promote its Titan leather motorcycle boots. 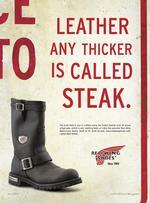 Colle + McVoy created the campaign. - Shaun Irving compares a recent Coke commercial and a video called The Winking Circle which is about a bunch of kids getting creative and finds striking similarities. - Ernie Landante attended ClickZ's Online Video Advertising Forum last Friday and interviewed a bunch of the speakers. You can view his interviews, which will be released over the course of this week, here. - Leo Burnett in Budapest has, as it has in the past, posted 50 commercials for people to vote on so they can pretend they are at Cannes. Lynx is promoting its latest online stunt called Billions of Bikini Babes which will, apparently, air in the UK at 7:25PM on ITV1 just prior to the England versus Sweden football game. The trailer promises bikinis, babe, beaches and one guy that looks like he's in bikini nirvana. That Sasquatch just won't die. This time, he's alive and well for a Jack Link's Beef Jerky campaign that involves four TV spots, and online site and...please tell us this is going to stop soon...a MySpace profile. It looks like a New York agency's cultural sensibilities didn't match those of Eagle, Idaho residents. In this video, a local news reports Eagle's Mayor is threatening to cancel Eagle Fun Days this weekend, part of which is the local fire department's Rocky Mountain Oyster Fest. With the festival based on bull's testicle, the fire department thought it would be a good idea to promote the event bay asking a New York agency to help ouot. They did with some spots that might be considered humorous to some but Eagle mayor Nancy Merrill told the fire fighters to pull the spots or she'd cancel the event. The fire department complied, pulled them off the website and canceled their TV schedule. Radio ads did air but Merrill has called a meeting and is still threatening to cancel the event. While the agency told the television station they meant no harm, the station is apparently, keeping the agency's name confidential. Come on guys. Step forward. Take credit. The campaign's great. Just not for Idaho. UPDATE: FCB did the campaign and CEO Steve Centrillo sets the record straight in the Comment section stating they are fully aware of Eagle culture since one of FCB's creative directors comes from Eagle. He also states Mayor Nancy Merrill is overstepping her bounds, advancing her personal agenda and using her position as a bully pulpit. UPDATE II: You can see all the work here. "Drinking Silk was my first step to the "wow Amanda is so fine" comments. I eat healthy because I can. I get herbal swamp mud and fragrant sea cucumber body wraps at the spa because I can. And I drink Silk because I can. I know that this is the only Amanda I get - you better believe I flaunt it." Here's a humorous mash up of the over bearing product placement on The Apprentice and the recent crash commercial from VW. 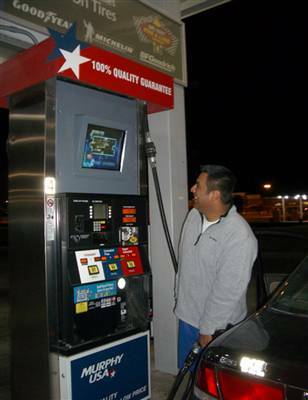 Given that there's not usually a whole lot of eye candy at the gas station as, say, there is on the sidewalks of New York during a hot summer day, the launch of Gas Station TV, currently testing in Dallas, sounds like a really great idea. After all, for the 3-5 minutes it takes to pump your tank full of gas, there's not a whole lot to do other than watch the numbers roll on the pump or marvel at just how far over the belt line the stomach of the guy in the car next to you hangs as he waddles back from the convenient mart with yet another bag of twinkies and a 64 once bottle of sugar and chemicals.